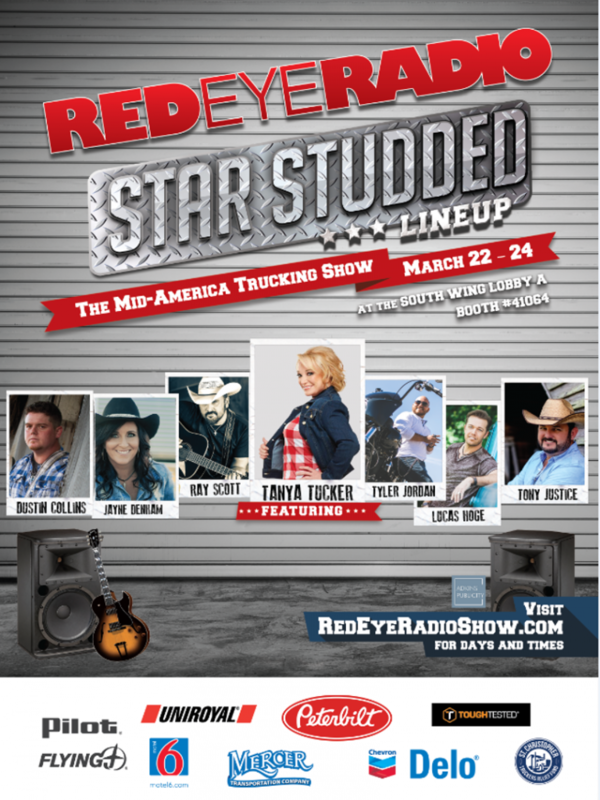 It will be a boot scootin’ affair as Westwood One’s Red Eye Radio network kicks the Mid-America Trucking Show up a notch as THE premier celebrity rendezvous spot in Louisville. This year’s star-studded event features live appearances and musical performances from Country artists: Tanya Tucker, Dustin Collins, Lucas Hoge, Ray Scott, Tyler Jordan, Jayne Denham, and Tony Justice. Red Eye Radio will be treating attendees with this incredible mix of extremely talented and accomplished artists firsthand. These artists have won awards or had nominations from; the Grammys, the Academy of Country Music, Country Music Association, Country Music Association of Australia, and Male and Female Artist and Song of the Year. To say this lineup is anything less than spectacular, would be an understatement. Visitors to the booth will also be able to register for Daily Drawings for CB Radios, GPS Units, and much more. Red Eye Radio’s 2018 Mid-America Trucking Show events and activities are powered by: UNIROYAL TRUCK TIRES, PILOT FLYING J, CHEVRON DELO, PETERBILT MOTOR CO., MERCER TRANSPORTATION, MOTEL 6, TOUGHTESTED, and THE ST. CHRISTOPHER TRUCKERS RELIEF FUND. The Mid-America Trucking Show, a trucking convention with over 70,000 attendees, will take place March 22-24, 2018 at the Kentucky Exposition Center in Louisville, KY. Eric Harley, host of Red Eye Radio, will be on site to introduce attendees to the sizzling lineup of country music artists. The special guests will visit Red Eye Radio’s lobby booth (41064) for signing autographs, taking photos, and talking with drivers. For specific days, schedule, and details visit www.redeyeradioshow.com. With coverage across the United States and most of Canada, Red Eye Radio is hosted by radio veterans Eric Harley and Gary McNamara. The program airs Monday through Sunday from 1am – 6am EST on more than 240 AM/FM stations, on-demand/podcasts, on RER’s free downloadable app from iTunes and the Google Play Store, Amazon’s Alexa, and Live Streaming.